Photo published in print media. 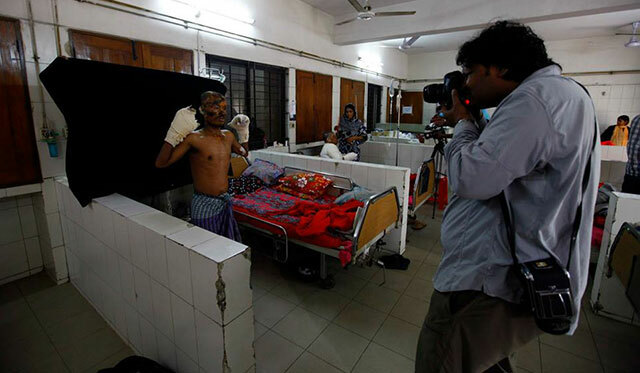 “On February 8, the major dailies of Bangladesh published a report titled ‘Shooting at a Burn Unit,’ where it was reported that despite criticisms, photographic shooting took place in Dhaka Medical College and Hospital’s Burn Unit. On 7 February, a team of 10-12 photographers (from a private organization) took pictures of an arson victim in an aesthetic manner. Sources say that some of them had cameras, some had light, and some carried a blackboard and so forth. Due to protests from the victim’s relatives, they had to leave the location after half an hour. This created uproar in both print and online media (not to mention social media). 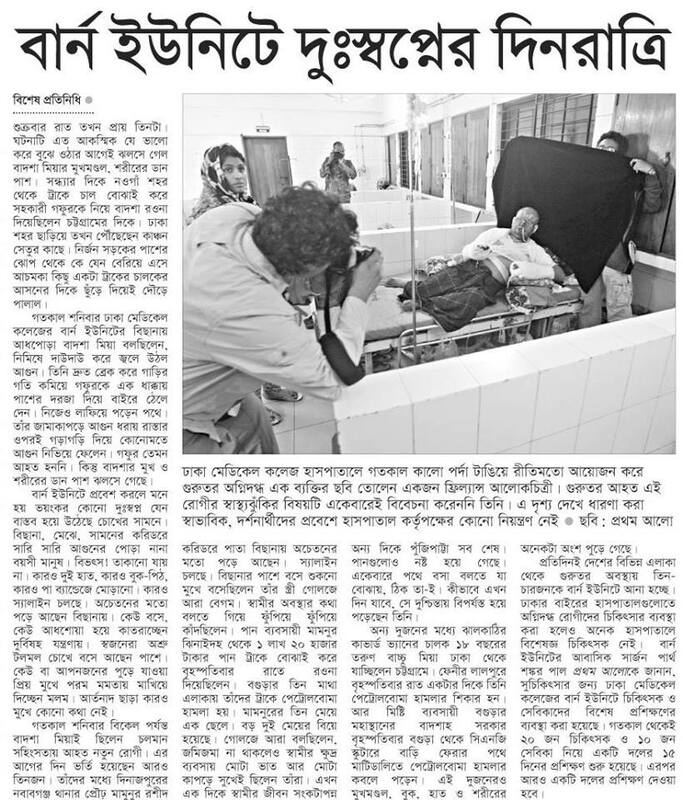 Despite photo and video journalists taking picture of burn victims every day, the appearance of renowned international photographer Saiful Huq Omi (founder of photography school Counter Foto) and his team caused frenzy in the media.” Here Saiful Huq Omi replies to his critics, and discusses related issues. The interview was taken by the Editor of Priyo.com Zakaria Swapon. Excerpts transcribed by Rajiul Hasan. Translated for AlalODulal. (Priyo.com) what really happened that day? (Saiful Huq Omi) Let me answer this from a photographer’s point of view. I have worked on political violence for quite some time now. A lot has been taking place in the country which is unacceptable, but I will not get into that debate and the fact remains, that people are getting killed. These people are the innocent and common people of the country. Their bodies are being attacked. It is not only they, who are being attacked physically, but also their loved ones who are affected by it. Many relatives of the arson victims quote in front of the camera and on record that the person torched is the only wage-earner in the family. So if I have to work on this kind of project, I have to think deeply. If I have to visually deliver this true message across to my audience, how can it be done? A limitation of reporting is that you cannot publish news that took place two days ago. There are many moments of history, which decides the future. As a documentary photographer I always strive for this. From a Bangladeshi political perspective, this is not an accident or act of terror. A lot of things depend on this. I believe that a political turning point is in the offing. So I could not let my photograph get lost in the midst of all the other photographs, it had to be documented in an artistic manner, to stand apart from the others, so that people would never forget that it happened. I visited the burn unit 15 days ago as an artist. I observed what happened over there. I thought about it deeply, about how I could make my pictures more memorable and thought-provoking from the rest. After 15 days of thinking, I decided that I will use a black curtain in the background, as black is the symbol of mourning. I had to shoot in a controlled environment, where I could not move my subjects in any possible manner, and I reiterate this, as it would be the most inhuman thing possible. I took a black cloth on that day, which was actually a curtain from my office. I wanted to use an archaic camera for the shoot, known as Hasselblad, but I did not have the necessary environment to use its tripod, so I had to use a regular camera for the shoot. When I entered the ward, there were already over 20 photographers. There were 15-20 beds in the ward, which had patients in all them, in critical conditions. Only 3 or 4 of the victims were in sitting positions, whereas the others were not. The ones whose pictures I took, the black curtain were used behind them. Never for a moment did I ask the subjects to move even a millimeter, nor did I ask them to pose for the pictures. This has been spread across news and reports that I had asked them to do so. It is highly incorrect and humiliating for me. (Saiful Huq Omi) Let me explain what actually happened. There was this patient who was sitting on a chair in front of me. I could not take his picture as he was not lying on his bed. I could take many other photos, but I wanted to take one single photograph in the entire ward, that told a thousand stories. Suddenly the man jumped up from his chair. I thought he was in pain or something. I had asked burn victims previously, who had informed me that uncontrollable movement is part of their painful recovery process. He then reached down for his sandal, which I offered to bring closer to his feet. But he got embarrassed and then used one of his feet to reach for a utensil beneath his bed. He had some spit stored in his mouth, which he spat on. I figured he would sit down after this, and had decided that I would not take his picture if he did not sit down. But he stood there with his hands raised above his waist. He had his hands raised like that even when he sat down previously. You can ask him, along with a famous journalist who had informed me that he had his picture taken like this before as well. Then I asked him whether I could take his picture like this. You must keep in mind that he was aware of what was going on over there, with all the photojournalists taking pictures of everyone. When he gave me his consent, I asked him whether my staff could take the black curtain behind him. He approved and I did so. And I can say this with full responsibility that it was a matter of a minute or two. When I left, he was in that same position for 20 seconds, 30 seconds or 5 minutes. But then someone took a picture of me taking pictures of that man, which was sadly, very misleading. It was later published with malicious intent and devoid of any ethics, and obviously purpose-induced. (Priyo.com) who took that picture of you in it? (Saiful Huq Omi) I do not know who did it. I did not think for a second would take my picture. Let me ask you a question. In this similar scenario, would a photographer, no matter how reputed or famous, be that stupid to say ‘move and let me take a picture?’ S/he would never say such a thing because that would result in instant thrashing. After finishing my shoot, some journalists charged me for my actions and started abusing me. I kept on telling them that I had taken the consent of the victims first, and had taken their pictures as they were. The only difference was that I had used a black curtain as a background and that was it. Rather, unlike other photographers, I took consent of the victims first, that I would take a few portrait shots and then leave. I realized that our argument had started to escalate, resulting in the disruption of peace in the ward. I figured that taking these pictures is not for selling purposes, I came here only for the sake of my conscience. There was no reason to argue there, so I left. Later this scuffle made way for more scuffle in the media. There are many groups and factions in the media industry, which I was never a part of. This scuffle was only a catalyst to defame me and the reputation of the photography school that I run. I believe that the journalists who defamed me had only done so impulsively. This report branded me as uncultured. People started to believe that was how I operated thus far. But I feel that journalists should have crosschecked first and gotten their facts in order first, without jumping to conclusions. Without taking into consideration my part of the story, they not only ventured outside of their journalists ethics, but resorted to one-sided stories, mainly propaganda filled. As seen with Gonojagoron Moncho and other contemporary elements, defamatory remarks in social media have become very popular these days. In a country where news of a person being spotted on the moon goes viral on Facebook, it is better to keep your eyes open in such a country. There is no accountability in social media. If politicians post a status tonight, it becomes a lead story the next day. It was through Facebook that abuses and criticisms were drawn against me. A certain newspaper even made a feature report against me, with other papers following suit. (Priyo.com) there were other photojournalists there as well. But why are they trying to isolate your photo from theirs? (Saiful Huq Omi) A strong sense of emotion works for them in this regard. They work in such a medium where it is necessary to do so. But the fact that photography can be done in a thousand way, they need proper guidance about it. The basic question here was whether I had violated any human rights, which I did not. It is very sad to think that using a black background is blasphemous according to them. They fail to think that my method is similar to that of theirs. If they had realized that then none of this would have happened. But someone thought so and retorted by saying that what I did was not news photography. It failed to occur to him that there is a vast universe outside of news photography, which he knows nothing about. (Priyo.com) Photographers had taken pictures over there as well. (Saiful Huq Omi) There is a debate in the photography community regarding this. During Bishwajit murder case, the murderers were pictured in broad daylight. Photographers get news of cocktails being hurled, buses being burned even before the police. So when they are held into account, they are not liable to disclose their sources. So is the morality of getting the right picture more important than that of a human life? Today I am being called inhuman, but the newspaper editor and others who hurled abuses at me, their humanity needs to be questioned first. (Priyo.com) Similar pictures are being published every day. Why is yours being vilified? (Saiful Huq Omi) I think that Facebook is our platform for both our joys and sorrows. Today’s burn victims have my utmost sympathies, and the people protesting this incident online have my utmost respect. But they could have been more controlled in their use of language. Shouldn’t a newspaper have been more responsible at least? Newspapers are supposed to crosscheck and verify everything. But I have been vilified without being done so. There may be differences in opinion, but I cannot be humiliated like this. A prime minister, a former prime minister, a Nobel prize winner – all must be addressed with the highest respect. But that is absent in this country. I am nothing compared to them, so how can you expect me to receive the same treatment? We do not see anything other than the black or white mould. Our photographers have also become victim to this. Their main source of anger is that piece of black cloth. If that is my crime, I am willing to apologize for it. But the heinous crimes that photographers have committed over the past 4 decades needs to be accounted for. I can give examples of them telling the police to beat people up more, so that they could get their shot, or asking terrorists to throw some more cocktails for that extra special shot. It is not right to play the blame game right now. But they should have at least listened to the accused for once. No one contacted me for my statement over this. Only when the follow-up news was published, then they came for my statement. No one from Prothom Alo asked me for my opinion, only BBC had asked so. Bangladesh Protidin and other papers had published incorrect reports of me leading a 12 man team for shooting in the burn unit. If such fabricated reports come out of those newspapers, then where is the safety of anyone from such vile reports? They can make anyone controversial anytime they want to, as per their whim and editorial policies. What could be more disgusting than this? Media must be the mouthpiece of the people. So they had to be more responsible about what they publish about me. I do not deserve this injustice caused by them. They could have published it anyway, but at least including my side of the story. Dhaka Tribune claimed that they had talked to me, but they had not contacted me till the morning after publishing date. What standard of journalism is this? (Priyo.com) Do you have any message for the readers? (Saiful Huq Omi) I want to tell everyone that it is not easy to coerce something onto someone. It is a violation of human rights. If I had to give my life for taking a picture, I would still take the picture. But I never committed any act of injustice. I never caused any disruption in the patients’ recovery process, nor did I ask them to move at any point. I took their pictures as they were. A limitation of photography is that it is needed to go to the spot to analyze, nothing academic about it. It can tell a truth, or even a lie. I have become the example of the same ethical question in photography that I have taught my students thus far. My message is that you may be disturbed by my pictures, even if it is 100% true, but I did not mean to cause any pain intentionally. Those who are involved in this unethical practice, I advise you to be alert about them. I would also ask you to think twice and not believe someone who says something with an ulterior motive. I hope people can come to the proper conclusion using their own logical reasoning. I can give you an example, when I went to the US to give a lecture at a university, in a class of 200-250 students – I asked them how many of them believe what BBC-CNN tells them. Only two hands were raised. This is not to disrespect them, but people over there crosscheck facts. If CNN tells them something, they want to know what BBC is telling them on that matter. Our readers must also come to conclusions in the same manner. We must stop believing men to be on the moon. If we cannot stop believing news like that, we cannot advance as a nation. We must be educated to advance, consciously nevertheless. We must come out of this character defaming mudslinging culture. (Priyo.com): Thanks a lot for your time. We would like to extend our apology for publishing the picture without your permission. Nevertheless, we believe you have every right to defend yourself and share your explanations with our audience. (Saiful Huq Omi) I would like to extend my thanks to you and your website for providing the opportunity to share my thoughts on the matter. Priyo.com Editorial note: The stories behind the world famous photos we have seen so far, are- in many cases-not the most lauded ones. The photographer who received international kudos for her the tragic shots of Rana Plaza is renowned to all; however, what many do not know that she too was deeply agonized by the disturbing pictures of all those dead bodies. War photographers risk their lives every now and then to capture the moments of the battleground; leaving their camera behind, some of them even render help to the war-stricken people. Irony is none of us get to see the picture of those trying times! What we see are the ‘beautifully shot’ pictures of dead people, devastated land or portraits of people surviving the unbearable scars of the war. Therefore, a photographer has to strike a balance between the beauty and the ugliness, which is not needed in many other professions. Normalcy is as human beings we will sympathize with the sorrow of others. Reality is we will feel agitated looking at the pain that one has to endure. My pledge to everyone is that we should refrain ourselves from the act of character assassination of someone just for some easy popularity. In Bangladesh, the scope of work is not that huge. Considering that fact, if everyone gets into mudslinging with one another, then that further ruins the scope and leaves us of no good option to move forward. Next Ekush, are you blood rose of Senegal?